I love playing games! 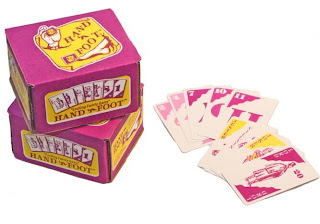 However, I do have one game that I love playing more than any other, and that is Hand and Foot. For those of you who do not know what this game is, you must find out. When I was probably in the fourth grade (hehe), my Grandpa and Grandma Houston taught me how to play. I am not kidding my mom and I would visit them several times a week and play cards (H&F) FOREVER. This is one of my favorite memories with my Grandparents. I learned many things from my Grandpa like how to cheat, how to sulk if I lost, what a nasty one is, and lastly that it is never my fault if my team loses :) I also learned from my Granny that I was, "slower than tar going up a hill on a cold winters day!" hahahaha This quote has taught me to stay on my toes during the game, and not take too long on my turn. It is one of my favorites. Anyway, I have just been playing this game so much with my family, friends, and Jordan's family that I just had to give the game a little shout out :) It is definitely on the top of my game list! Yay for Hand n Foot! I'm bummed we didn't get to play with you guys last night!! We got our own set of cards for Christmas and I am so excited about it! Let's have a Hand n Foot night ASAP!! What do you mean kinda boy toy!??? You said you guys had been ring shopping the past week!!!! I wish I was one of the few who knew about this game. Thanks for never introducing it to me all those months that we shared a bed. I know what you mean though. Everytime someone knows what chitty chitty bang bang is, I get pretty excited. Just so everyone one knows, Tori's comment is not legit! OK, OK, OK, I know it has been forever!! !